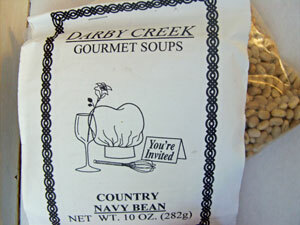 In a 5 quart pot, combine the beans and flavor packet with 8 cups water then bring to a boil. Cover and boil until beans are tender. Add more water if necessary. At this time you may add pieces of ham if desired. For a Tucany Bean: Add a half cup of uncooked pasta the last 15 minutes of cooking, and cook until pasta is tender. Add more water if necessary. Bought the 3 soups and 2 dips from the LA County Fair booth. This soup is fantastic. I did add the ham and some pasta, but the flovor alone is outstanding. Cant wait to buy more at the fair next year.